You might be surprised what you can find in your own refrigerator to turn into something really special! The most annoying thing for me is when people constantly buy things and just let it go bad inside the fridge! We buy so much crap and yet don't really use it in the end! My country (Philippines) and other places have this tendency to be VERY materialistic and hoard whatever they can for either convenience or showing off. Whatever the reason, I don't like it when I see food just going bad inside the fridge just because it was forgotten. So when my mom bought a huge amount of basil for a friend of hers that was eventually not picked up, I decided to put the basil leaves to good use before it went bad! And wow did it make a HUGE amount of pesto sauce! So anyway, I just randomly searched for a pesto sauce recipe, which I wanted to use whatever ingredients I had on had, without having to buy anymore ingredients from the supermarket. The main purpose anyway was to get rid of whatever food that was about to go bad in the fridge! 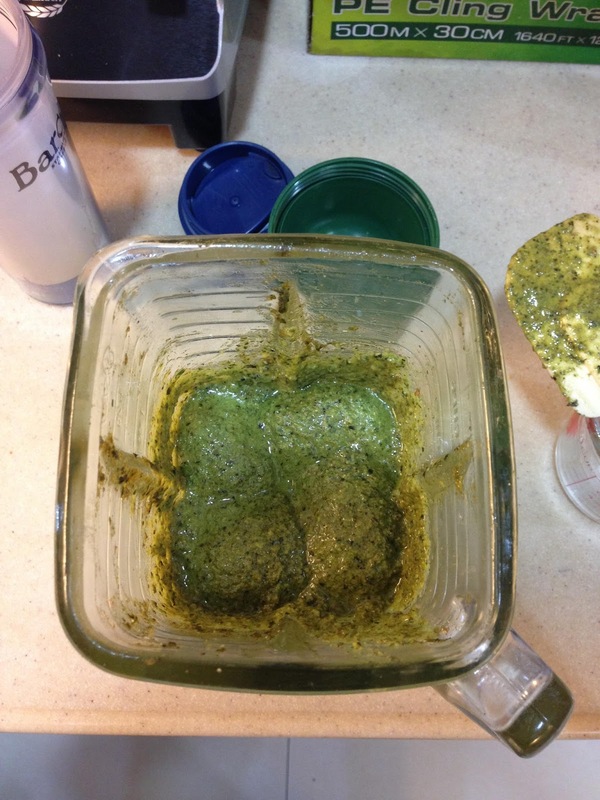 So I searched online for a basic pesto sauce recipe that was flexible with substitutes! Any website actually had good recipes for pesto sauce like the one from All Recipes, Food Network or NY Times. Anyway, I got inspired by all these websites to come up with my own version! But what I did not expect was the fact that the amount of basil leaves I had at home was enough to make 3 BATCHES of pesto sauce! I am by no means saying that mine is better or anything like that. I just wanted to show that whatever food you may have at your home could be turned into something very delicious such as this versatile sauce! Honestly, pesto sauce is a refreshing twist from the typical tomato red sauce for pasta, pizza or sandwich filling. Have fun creating simple, but delicious meals in your own home. Turn an accident into something wonderful and meaningful in the end! Just like traveling, you may not get the outcome you planned or you may have arrived at the wrong spot, but you can still turn your awful moment into something memorable by enjoying the view and the surroundings you have there! As you can see, I had so much basil leaves on hand with little cheese! But I made it work! My blender is pretty small, which is why I made this recipe in 3 batches! Still worked! 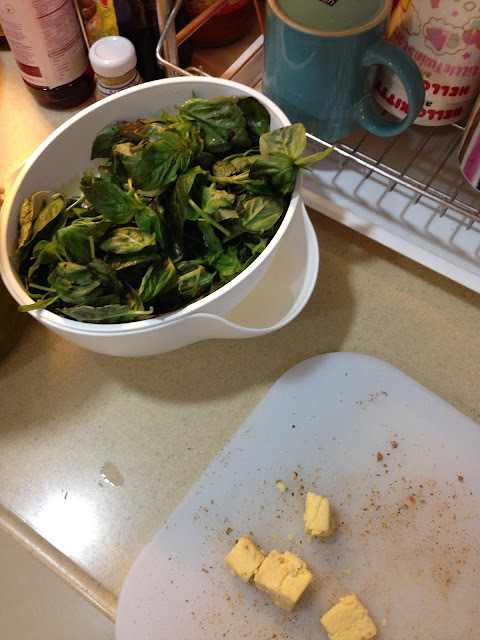 Chop the basil leaves into small pieces just enough to be able to blend in the blender. Chop the walnuts or peanuts as well, and combine that, basil leaves, garlic, cheese and 1/4 cup of the olive oil in the blender. 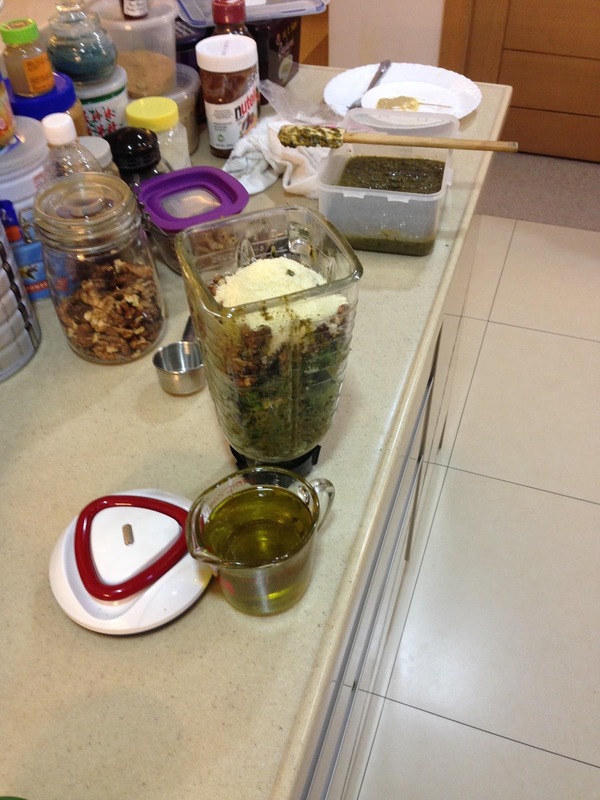 While it's mixing, gradually pour in the olive oil in the small hole of the cap of your blender. Keep mixing until it's finely pureed. Scrap the sides of the blender. Add salt and pepper to taste. Once it's done, store into airtight containers keep in the refrigerator for one month or in the freezer for up to 3 months. 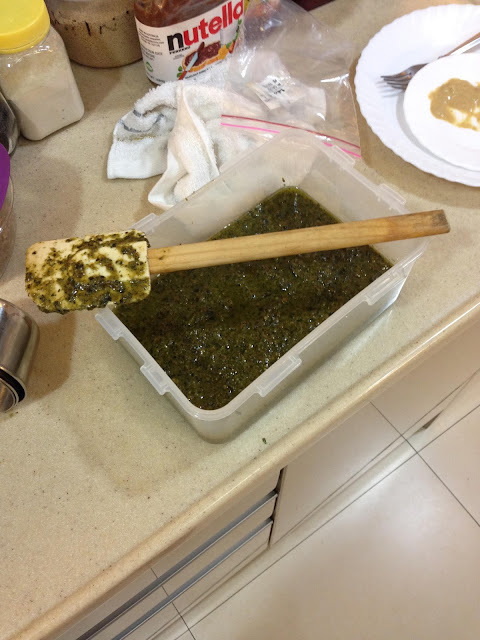 *It's normal for the oil to separate from the basil puree. If frozen or solid, wait for it to thaw then mix it all together again. Honestly, that was the first half of the batch that I made of the sauce! Of course I didn't want to make this article so short after being on a long break, so I decided to add an additional recipe to go with the pesto sauce you just made! 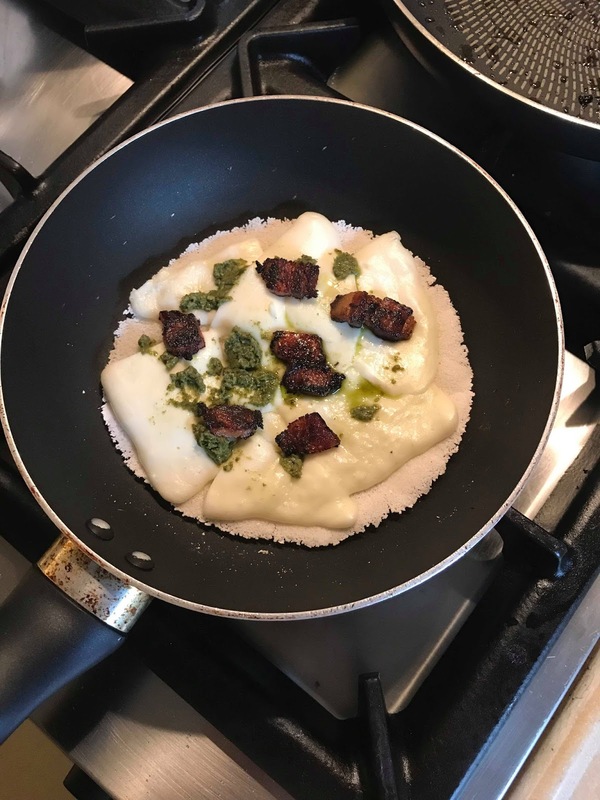 So here I am presenting to you an unusual but surprisingly tasty alternative to crepes or white bread: Brazilian Tapioca! Now as many of you know, my obsession with Latino culture, especially Brazilian, Peruvian and Mexican, has led me to attempt making recipes such as the forever addicting Pão de queijo or hearty Feijoada. This will be my third attempt at making a Brazilian food basically known as Tapioca. Tapioca starch or cassava flour (also known as double A or AA powder in my country, Philippines) is a very powerful starch that is used to make breads without leavening or cakes as well. It can be poisonous if consumed from the plant raw due to it containing cyanide. But after it being processed, it turns into some of the most well known products such as tapioca sago pearls and cassava cake! Crispy and a bit chewy, healthier than regular white bread. Oh and did I mention, it's gluten free?! This recipe can have savory or sweet fillings such as cheese, bacon, corned beef, pesto or even condensed milk or chocolate! It must be hydrated with water in order to get this texture, then pushed through a strainer for it to be as fine as snow. It requires no oil or fat at all in order to cook this. Once it is heated in the non stick pan, it melts together to make a crepe! It can easily be flipped into the air or with a spatula! I have yet to achieve my dream of making it to Brazil, but for now at least I can say I know what some of their food tastes like because of this. Give this recipe a try, and it may just become a food staple for you guys just like in Brazil! Bom apetite! Look at all that melty mozzarella cheese with pancetta bacon cubes and pesto sauce! Best eaten fresh! In a medium size bowl, place the tapioca starch. Mix the salt into the water. In 1-2 tablespoons at a time, add the water to the tapioca starch. The mixture will form into clumps like sand or snow. Break them into small bits using your fingers. Keep mixing with your hand and gradually add the water. You will notice if you added too much water because it will become like a thick liquid. In case that happens, just add more tapioca starch until you have a good consistency. Pass the hydrated starch through a fine strainer or sieve using a wooden/metal spoon or your fingers. This may take some time, but after this will be easier. 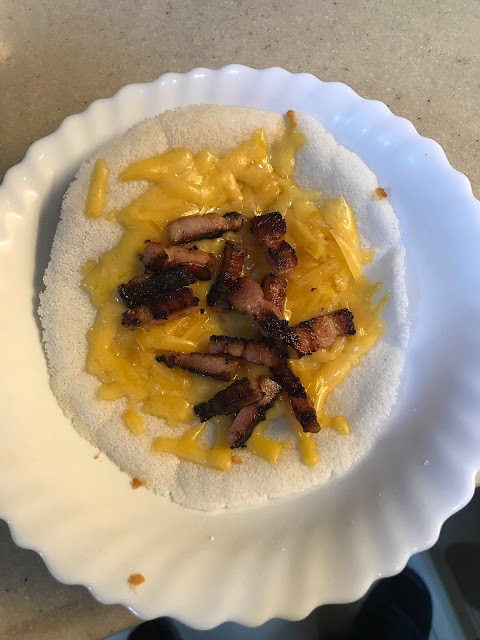 Sprinkle a good amount (around 2-3 tablespoons) of the tapioca starch onto the pan, and press down using the back of a metal spoon. Place the place on the stove and put on medium heat. Let the crepe cook for around 30 seconds to 1 minute. You will notice the sides start to rise a little bit, and when this happens, you can flip it using a spatula or tossing in the air. After flipping, you can add your toppings such as mozzarella or cheddar cheese on the cooked side along with meat like bacon or corned beef. Let it heat on the pan for about 1 minute, then drizzle the sauce or whichever toppings you desire. This should be eaten immediately as the crepe stiffens as it cools. This tapioca crepe must be eaten immediately as it stiffens when it's cooled! I bet you can easily finish this bacon and cheddar cheese treat! If you want to order cookies and other baked goods, please contact me using the form here. Thank you!